Guns N' Roses Chronicles Part IV "It Might Be the Best Record I've Ever Heard"
By the mid-summer 1987, I had heard “Mr. 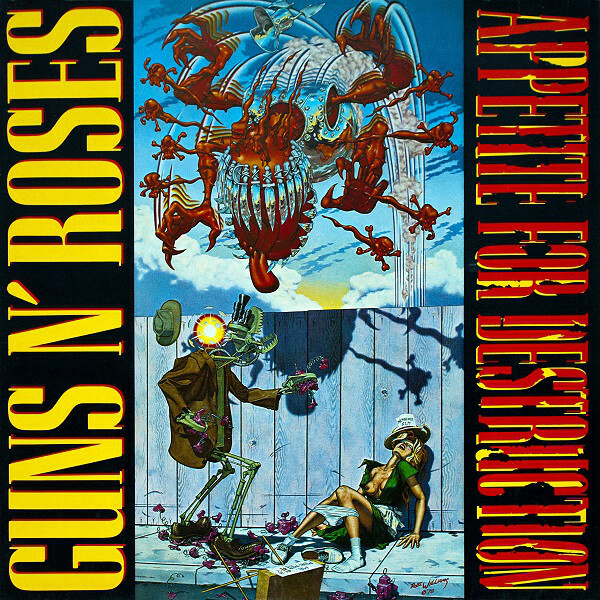 Brownstone” and “Welcome to the Jungle” on KNAC enough times to know I really wanted Guns N’ Roses’ full album. This was no small decision. I was 13, could wrangle the occasional babysitting gig for extra cash and tried to make Christmas money stretch out as long as possible. Occasionally, I could catch my stepdad in a good mood and he would let me pick up a cassette at our local Music Plus or Tower Records, but his good moods and generosity were unpredictable. In short, albums were a major purchase in my young life. When I finally decided to take the plunge with Guns N’ Roses, I was irritated that their debut album hadn’t even hit the stores yet. I was finally tipped off to the release of Appetite for Destruction when the Sunday “Pop Eye” column in the Los Angeles Times ran a piece about the album cover being banned because of a controversial painting that was used. I had to get this album. When it finally came out, I couldn’t find it anywhere. Stores near me in the San Gabriel Valley were sold out, along with stores in Orange County where my dad lived. I was impressed that this band was so instantly big that record stores couldn’t keep their album on the shelf (it would take a while for me to realize that most stores only ordered a coupe of copies or didn’t bother to stock it at all). At that point, whatever money I had burned a hole in my pocket and was spent. Guns N’ Roses would have to wait. Earlier that year, my brother’s contentious relationship with our stepfather had reached a tipping point and he moved out. He had finished up his senior year of high school while living at our grandparent’s house in the next town over. After that, he headed to Yorba Linda to live with our dad and stepmom. It sometimes feels like the term love/hate relationship was invented for my brother and me. We’ve had knock down drag out fights over the year, often peppered with periods of deliberate silence. But we also had the shared history of enduring our parents’ divorce and our mother’s remarriage which turned our lives upside down in the worst way. We also shared a love of Star Wars and music, so when Cory finally got his hands on a copy of Appetite for Destruction sometime in late August/early September of 1987, he called me immediately. I still couldn’t find a copy and didn’t have money anyway, so I needed to rely on the generosity of my big brother, which was never a sure thing. Fortunately, he had just started his first job as a bus boy at Marie Callender’s, but had quickly been promoted to line cook and was working crazy hours and picking up every shift offered to him. He was so busy that the next time I saw him, he let me borrow his copy of Appetite for Destruction to take home with me. Finally, I was going to hear what Guns N’ Roses was all about. My life would never be the same. GN'R Chronicles Part III "Welcome to the Jungle"...It's OK.